The latest news from Global Ice Center: Historical First: Sea Ice Free Both the NE and NW – Weathernews Inc.
On September 10th, 2008, the Global Ice Center at Weathernews, Inc. announced that sea ice in the North East passage (NE Passage) of the Arctic had decreased to levels that would allow ships to pass. 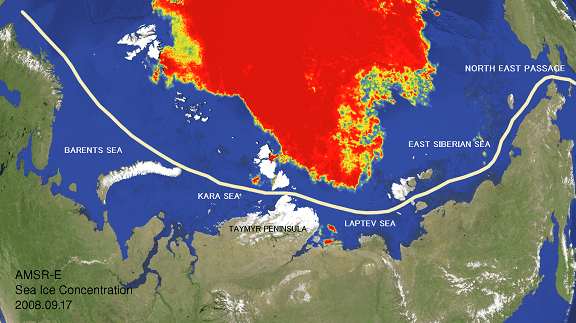 As the Global Ice Center had already announced sea ice melting in the North West passage, this means that since satellite observations of the area began in 1978, this is the first instance of an opening in both sea ice passages (the NW passage and NE passage). This is believed to be due to the effects of global warming. The Weathernews Global Ice Center continues to monitor global sea ice and providing the latest sea ice information. 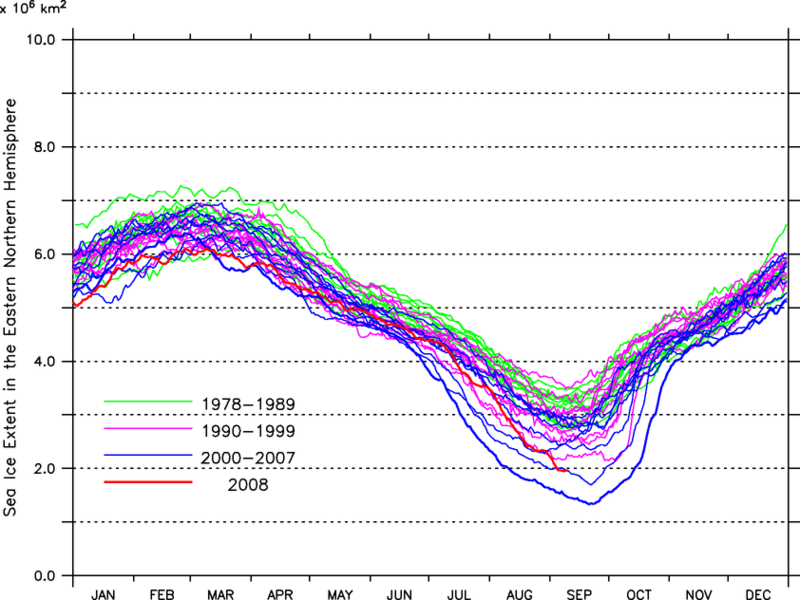 Sea ice in the NE passage has dramatically decreased over the past two weeks. A high pressure system covers the Taymyr Peninsula, and the temperature has been 2.5 to 7.5 degrees Celsius higher than average. In addition, the sea temperature has also been up to 3.0 degrees Celsius higher than average. It is believed that this is the major factor in advancing the high rate of melting this summer. Sea ice in the NE passage this year is the second smallest, after 2005, when the NE passage opened up for the first time. 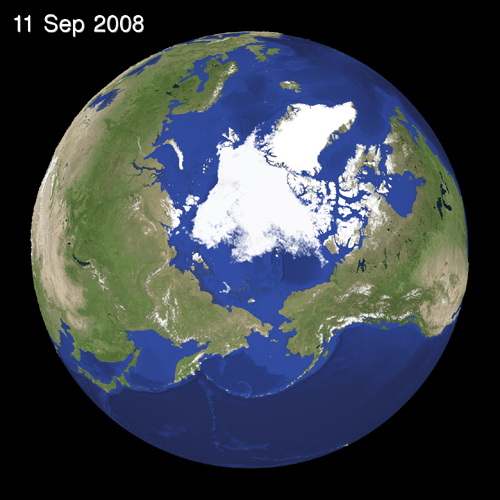 Sea Ice in the North West showed record shrinkage as of the end of August (August 27), 2008, breaking the previous record in 2007. Overall, this year showed the second most amount of melting since satellite observations began. Sea ice melting proceeded this year at a pace to rival that of 2007, and there was a chance that a new record could have been set, but the melting seems to have tapered off. After the middle of September, the melting season ends and air and sea temperature begin to fall, causing sea ice coverage to gradually increase. The WNI Global Ice Center will continue to monitor the conditions of sea ice.